Non-woven fabric is man-made & manufactured using light-weight polymers, as such the end product is immensely strong, durable and easy to work with. The current manufacturing processes of Non-woven Fabric has allowed it to become economical enough to produce Reusable Bags that replace Single-use plastic bags. Non-woven Reusable Bags have probably done more to clean up our environment than any other single element in the last 10 years - while it is not a perfect solution, it has been the most effective thus far. 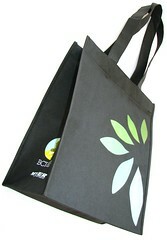 Find out more about Non-woven Fabric from Bag People.